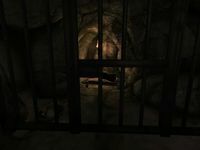 The Deepscorn Prisoner is a Nord monk who is added by the Vile Lair official plug-in. He will wear either a black robe or mage's robe, wrist irons, and a random pair of footwear. He is added to Deepscorn Hollow when you buy the Cattle Cell upgrade from Rowley Eardwulf. He owns a bedroll and never does anything but sleep, making him an easy way for vampire players to feed. Because he is essential, the prisoner can also be used as a method for training various skills. 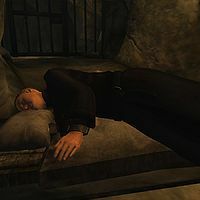 Attempting to speak to him will result in the following message being displayed: "You cannot wake the prisoner." If you cast a Paralyze spell on the cattle in the cell, paralyze him with the master Marksman ability, or achieve a knockdown with either Blade or Marksman, he will stand up but will not lay back down again. It is impossible to feed on him while he is standing up, and you still cannot talk to him. This bug is fixed by version 7 of the Unofficial Oblivion DLC Patches. This page was last modified on 13 July 2018, at 02:25.